Teach your child the importance of obeying God’s instructions through the adventurous life of Jonah. 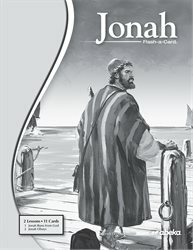 This lesson guide (already included in Jonah Flash-a-Card and Bible Stories) will help you as you teach the story of how Jonah ran from God, but later obeyed the Lord and saw many people become saved. This detailed guide gives you the content to teach, prompts for when to use the pictures, and review questions for each story to help you relate Jonah’s life lessons for your child and incorporate the lessons Jonah learned into their own lives.